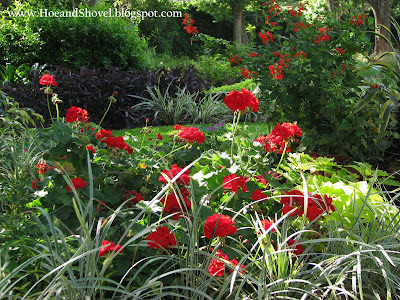 Today I planned to spend a couple of hours in the garden finishing up a few tasks I started yesterday. There was another list of chores waiting for me inside to ready for the Easter company tomorrow. It's always nice to be out in the garden early. Some of the smallest critters of the garden buzz about in those first hours. I got such a chuckle out of this bumble bee. It was enormous. 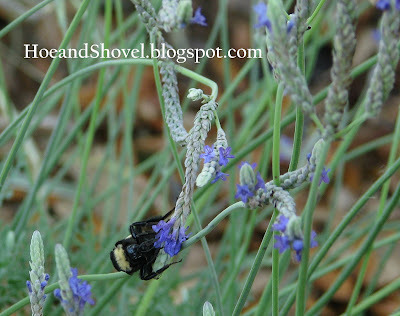 Buzzing from flower to flower it latched on and pulled the slender lavender stem over like a bungee rope and there it bounced gently up and down while nectaring. One after the other, each stalk giving way to the weight of this big fellow. Did I say he was enormous. What a joy to hear him and to watch him gather his sweets. A little later when my couple of hours in the garden was long gone and there I was still enjoying every minute outside this handsome guy shows up. It's been great to see all the dragon flies back to their busy activities. A pretty green chamelian I disturbed while moving some things around inside the screened porch. I'm glad he is happy there. Please do help yourself to all the bugs you find on the potted plants. Here's wishing each of you a very Happy Easter. Our family will be here celebrating this very special day with us. I hope you enjoy some time with loved ones, too. 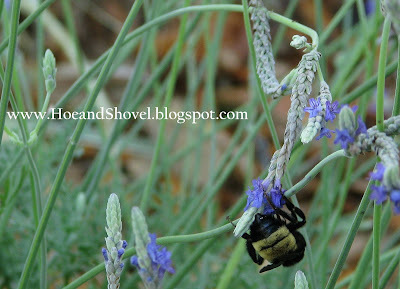 Great photos, Meems... Love seeing the bees in Spring. I know you have a great day planned for your family! Tell them I said hi and Happy Easter!!!! Happy Easter to you, too. It's another glorious day here! Meems, beautiful photos of the bee. Looks like he is really enjoying the lavender. And of course I Love the dragonfly. Have a great Easter and enjoy your wonderful family. Meems~~ Don't you find it gratifying to the bone when a bee, bumble or otherwise, makes good use of the secret nectar stored in your lovely flowers? Happy Easter to you too. 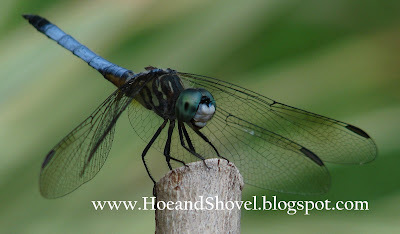 Love the photo of the dragonfly. Happy easter to you,too.Hoping you have a wonderful time with the little ones! Every critter has its place in the garden, doesn't it? And a job of its very own. I like the crawling critters. My four-legged ones, however, can't stop chasing them while they're on the job. I hope you've had a lovely day, Meems. 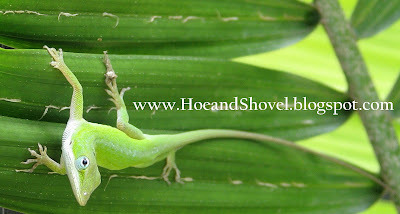 I especially love the reptile shot, with those digits clinging so easily to the blades of the plant. The dragonfly really stand out in electric blue. The bees always make me smile when they try to squeeze into flowers that are too small, or sway on the thinnest of stalks. Thank you all for coming by and leaving a comment. It is such a joy to welcome all the little visitors to the garden. The butterfly count is growing daily- I need to carry my camera around my neck these days. I've seen so many and have hardly been ready for them. The family left a little while ago. We had a great day together. I shooed the male peacock out of our oak trees after dark tonight. I think he had the idea he was going to roost there for the night. I kept hearing his call from inside. That part isn't unusual but I told Mr. Meems "That peacock sounds like it's in our front yard." Sure enough he had settled in for the night until I got out there and made enough noise to get him back across the street. And the saga continues. I sure hope you have all had a wonderful day. Oh, the business of the critters this time of the year is wonderful. Hope your Easter was grand! You got a great shot of the dragonfly. I can trace the design on his wings. I'm congratulating myself. I think my lavender made it thru the winter. It almost never survives our winters in heavy clay. We'll see how it does this spring. i have been slightly busy, with new puppy, great weather, easter celebrating. but i just read your last three posts. oh my where do i start. i love the post on native nuseries. i am determined to visit my nearest native nursery soon. i have to make an appointment with them and the weather has been so on and off. 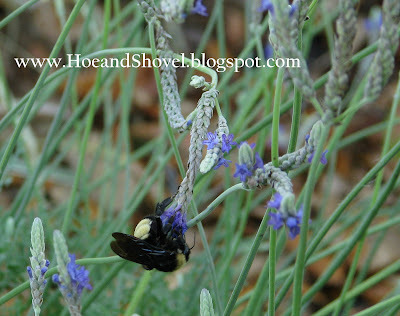 but like you i want to add lots of native plants...it seems to me to only make sense with all the benefits...less watering, plants that are used to our type of weather fluctuations, hardy, bringing beneficials to your garden...and on and on. i am glad you are finding these little golden nuggets of places to go visit. sometimes i think to myself why haven't i thought of this sooner. gardening is a journey and it is a most interesting one. i am discovering all kinds of things about myself too. i am so glad you gave all of us in bloggerville some great insight into your fav gloves. i have ordered a pair. they are beautiful but like you i am always on a quest for the ones that work best and are great looking too. i definitely want both. 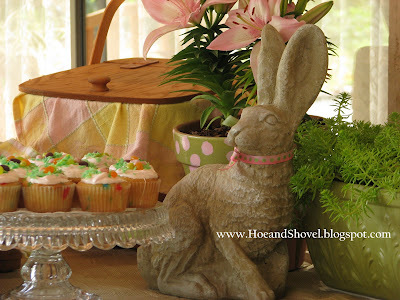 i love your natural tablescape for easter. it is lovely. i hope you had a wonderful day. we sure did. the weather was on the cool side but it didn't rain until the feativities were over. i am grateful for that...we have had very cold to very rainy easter's here. i was happy the children got to play outside. Oh yes Meems, I had a great time with family yesterday. It was great. It was overcast, windy and cool. I didn't mind a bit because inside was full of warmth, love and family fun. The rain held off until evening. I was most appreciative.